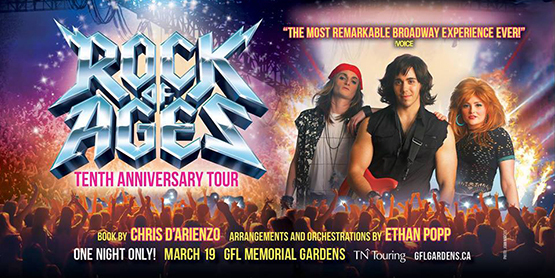 Fifth Estate Entertainment is proud to announce the mind-blowing, face melting, nothin’ but a good time, audience favorite ROCK OF AGES will return to the stage with a tenth anniversary tour. Nominated for five Tony Awards including Best Musical, the all new production will play at the GFL Memorial Gardens on Tuesday March 19, 2019. Doors open at 7:00 p.m. show starts at 8:00 p.m.